NASA will hold an audio press conference today (April 13) to update the public and reporters on its work to overhaul future Mars exploration plans in the wake of proposed budget cuts. The teleconference, which will be webcast live on NASA's website, will begin at 1 p.m. EDT (1700 GMT) and focus on providing an update on the framework and schedule of the agency's new Mars Program Planning Group, or MPPG, agency officials explained in a statement released yesterday. "The MPPG was established to construct a coordinated strategy and continue America's leadership role in the exploration of Mars within available future budgets," NASA officials stated in an announcement. NASA's 2013 budget request, announced in February, included significant cuts to the agency's planetary science and exploration efforts, a drop of more than 20 percent. In all, planetary science would be cut by $309 million, more than a third of that ($130 million) coming from the agency's Mars exploration program. The proposed budget cuts forced NASA to officially pull out of two European-led ExoMars missions, which would send two spacecraft — a rover and orbiter — to the Red Planet by 2018. Since the budget announcement in February, many scientists and critics have spoken out against the planetary science funding cuts. 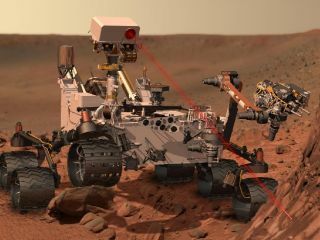 Meanwhile, NASA's next major mission to Mars, the Mars Science Laboratory Curiosity, recently passed the halfway mark to the Red Planet. The $2.5 billion mission aims to land a massive, 1-ton rover on Mars to determine if the Red Planet can, or ever did, support microbial life.